The ruling party is ‘militant in its political manoeuvres’ and won’t go quietly into the good night. Zimbabwe’s ruling party, Zanu-PF, were not likely to be defeated in yesterday’s election without a fight, experts have warned. 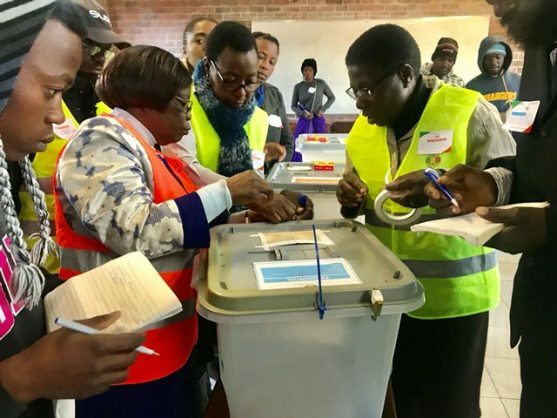 Zimbabweans took to the polls less than a year after the country’s military, aided by Zanu-PF, forced former president Robert Mugabe to resign after clinging to power for more than 37 years. While the popularity of Nelson Chamisa, the 40-year-old leader of the Movement for Democratic Change (MDC) sparked expectations of a new dawn in Zimbabwe, Zanu-PF was still well entrenched, famously powerful and militant in its political manoeuvres, said Derek Matyszak, researcher at the Institute for Security Studies. President Emmerson Mnangagwa was favoured by the international community, he said. “Chamisa has few allies in the international community. Everybody wants to see Mnangagwa win because of his promise of the normalisation of Zimbabwean politics. Allen Munoriyarwa, a researcher who was writing his PhD on the study of several past Zimbabwe elections, said the election may have been held too soon after the unseating of Mugabe. “After the demise of the Mugabe regime, people expected a unity government to preside over building economic stability, then managing fresh elections. But that did not happen. But yesterday it was the MDC that took the first shot at discrediting the election process, saying “unnecessary delays” in urban areas were being used to suppress Chamisa’s supporters’ right to a vote.